It’s an exciting time for flight training at the moment, with British Airways recently announcing the second phase of its Future Pilot Programme (FPP) and a new Pilot Apprenticeship scheme set to be launched in Spring 2013. The Professional Flight Training Exhibition (PFTE) at the Sofitel Hotel, London Heathrow on 3 November certainly profiled this growing interest in flight training with an estimated record number 1,400 visitors attending the event. It’s fair to say that the biggest draw for many of the visitors was the chance to find out about more about the British Airways FPP, resulting in the airline’s representatives dealing with a constant stream of would-be pilots throughout the day. 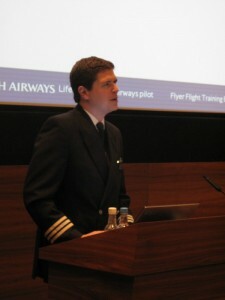 Lindsay Craig, Manager of Pilot Recruitment at British Airways, explained, “The exhibition has luckily worked out as perfect timing with the launch of our second phase of the FPP and it’s great to be here and be able to explain to people face-to-face what we’re after. We’re looking for people that have a real passion for flying, but also are interested in what BA is about, a key interest in a high-quality of customer service and knowledge of BA as a brand.” You can read more about the launch of the FPP and how to apply here. Mr Craig presented two seminars about the FPP in the afternoon, heard by a greater number of visitors than at previous PFTEs due to the introduction of two extra seminar theatres, each receiving a live feed from the main lecture theatre. 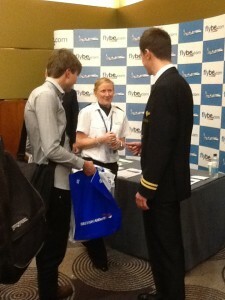 Other seminars given throughout the day included one from the West Atlantic Cadet Scheme and another by Flybe, which presented on life as a pilot for the respective carriers and discussed upcoming cadet opportunities in 2013. Ray Elgy, Head of Licensing at the CAA, added that the UK CAA is thoroughly behind the new scheme and will be working with both universities and FTOs to produce a standard format which airlines can use to offer an apprenticeship. The scheme will also be exploring the possibility of providing trainee pilots with access to student-loan type funding and the option of removing VAT on flight training. The first trial PPHA will be launched in March 2013 with ten cadets expected to begin training with airline Jet2. Find out more about the apprenticeships here. Other news from the day came from the Sennheiser stand, which chose the Professional Flight Training Exhibition as the opportunity to award its first UK Live Your Dream scholarship. The scholarship is for £1,000 and was presented to lucky winner Jacob Reynolds, who made an impression with his online video application. The award is run in partnership with Goodwood Aerodrome and winners of the award can use their prize for any type of training they wish, from a PPL to a PPL(H) or an IR, with the prize paid to the flight school on behalf of the winner. Bob Speller from Sennheiser explained that one further scholarship will be offered this year, with up to five more in 2013. For more information about the award and how to apply, click here. The British Airline Pilots Association (BALPA) also had a presence at the exhibition and the message the association passed on to aspiring pilots was a combination of encouragement and caution. BALPA representatives were on hand to offer practical advice, urging visitors to thoroughly research all the training options available to them and not jump headfirst into the huge financial commitment that, for many, comes hand-in-hand with pilot training.